and multi-instrumentalist. 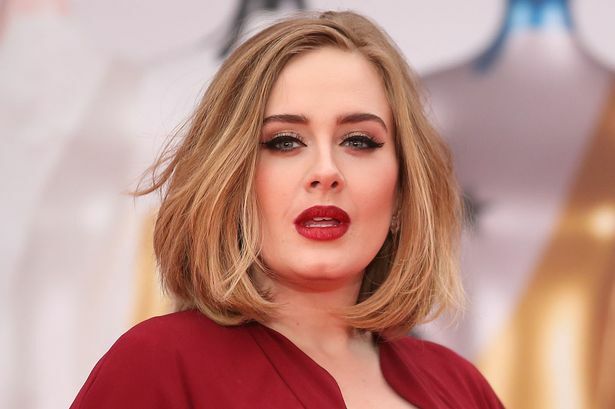 Adele was offered a recording contract from XL Recordings after a friend posted her demo on Myspace in 2006. The next year she received the Brit Awards "Critics' Choice" award and won the BBC Sound of 2008. Her debut album, 19, was released in 2008 to much commercial and critical success. It certified four times platinum in the UK, and double platinum in the US. Her career in the US was boosted by a Saturday Night Live appearance in late 2008. At the 2009 Grammy Awards, Adele received the awards for Best New Artist and Best Female Pop Vocal Performance. Adele released her second album, 21, in early 2011.The album was well received critically and surpassed the success of her debut, earning the singer six Grammy Awards in 2012 including Album of the Year, equalling the record for most Grammy Awards won by a female artist in one night. The album has also led to her receiving numerous other awards, including two Brit Awards and three American Music Awards. The album has been certified 16 times platinum in the UK; in the US the album has held the top position longer than any other album since 1985, and iscertified Diamond. According to the IFPI, the album has sold over 26 million copies worldwide. The success of 21 earned Adele numerous mentions in the Guinness World Records. She is the first artist to sell more than 3 million copies of an album in a year in the UK. With her two albums and the first two singles from 21, "Rolling in the Deep" and "Someone Like You", she became the first living artist to achieve the feat of having two top-five hits in both the UK Official Singles Chart and the Official Albums Chart simultaneously sinceThe Beatles in 1964. With her third release from the album, "Set Fire to the Rain", which became her third number one single in the US, Adele became the first artist in history to lead the Billboard 200 concurrently with three Billboard Hot 100 number-ones. Adele is the first female in the history of the Billboard Hot 100 to have three singles in the top 10 at the same time as a lead artist, and the first female artist to have two albums in the top five of the Billboard 200 and two singles in the top five of the Billboard Hot 100 simultaneously.21 is the longest running number one album by a female solo artist on the UK and US Albums Chart. In 2011 and 2012, Billboard named Adele Artist of the Year. In 2012, Adele was listed at number five on VH1's 100 Greatest Women in Music, and the American magazine Time named Adele one of the most influential people in the world. In 2013, she received an Academy Award as well as the Golden Globe Award for Best Original Songfor her song "Skyfall", written for Skyfall, the twenty-third James Bond film. Amanda Michelle Seyfried (/ˈsaɪfrɛd/ born December 3, 1985) is an American actress and model. She began her career as a child model when she was 11 and at 15 began her career as an actress, starting off with uncredited roles and moving on to recurring roles on As the World Turns andAll My Children. In 2004, Seyfried made her film debut in Mean Girls. Her subsequent supporting roles were in independent films, such as Nine Lives (2005) and Alpha Dog (2006), and she also had a recurring role in the UPN TV show Veronica Mars (2004–2006). Between 2006 and 2011, she starred on the HBOseries Big Love. After that, Seyfried appeared in her breakthrough role in the 2008 musical feature film Mamma Mia!. Her other appearances include leading roles in Jennifer's Body (2009), Chloe (2009), Dear John (2010), Letters to Juliet (2010), Red Riding Hood (2011), In Time (2011) and Gone(2012), Cosette in the musical film Les Misérables (2012), and Linda Lovelace in the biopic Lovelace.